I’ve been totally useless at doing ‘Plan With Me’ posts so I thought I would try something a bit different and go with a ‘My Week’ posts. I’m starting with next week, Monday 8th August. I’m trying something a little bit different this month, the reasons why will be explained in a post later this week. I am using Just So Stationery inserts and I’ve split the weekly into two sections. 1 is for my blog planning the 2nd is for my everyday planning. I love the layout of these inserts with the notes and to-do sections on the left. 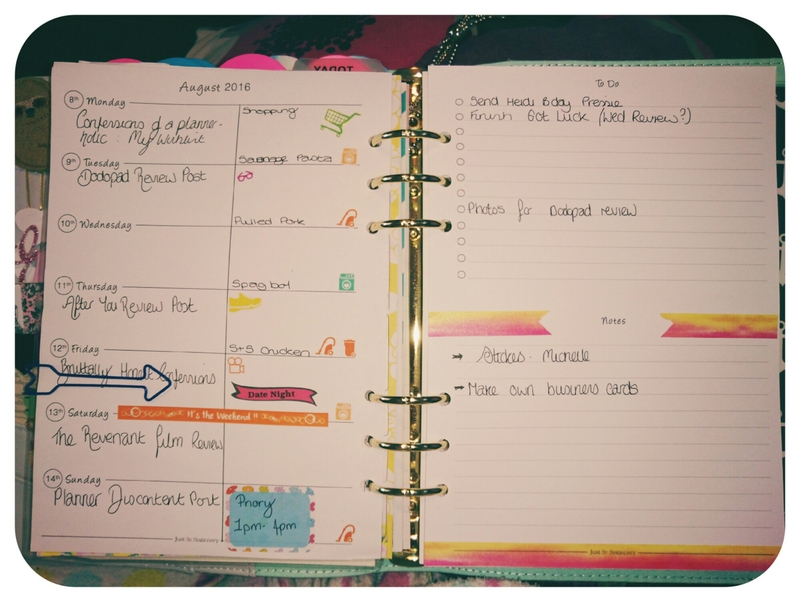 It means I get an overview on my priority tasks without having to search for them in my weekly diary. I’ve kept my decor really simple this week while I adjust to the new set up. The washi comes from the Micheals Recollections Watercolour tube I was luckily enough to get from someone here in the UK. The stickers are from UglyBugDoes, It’s Only Me Caralee, The Geeky Planner and AJ6Designs. I have the new Carpe Diem Ballerina planner on pre-order which should have been here but is currently delayed. I am looking forward to that arriving to try out the new vertical inserts.